Vectors are fair game in Alg 2/Trig as Law of Sines/Cosines application problems, and we get one measly day to spend on it. Not an issue for kids who are taking Physics concurrently, but we don't get many of those since Alg2/Trig is sophomores and juniors. With 42 minutes I couldn't come up with a manageable way to use those static spring loaded pull scale things the physics teachers have. Without some kind of physical demo, at least, this lesson is beyond meaningless. You want me to draw arrows? Why? So we push desks around. Pushing desks around is pretty good. Do not at all remember if I thought up this idea or got it from somewhere, so if it was yours, email me and I'll happily give you credit. Best guess, this prompted me to go searching around youtube. 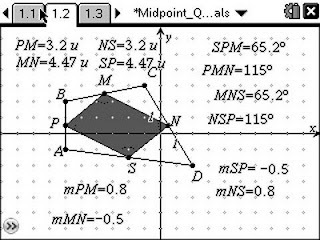 I am frequently poo-pooing TI's offerings on their website around here, so I thought I'd balance the karma by advertising a pretty decent activity we did today: Midpoint Quadrilaterals. It has the right amount of intellectual rigor and things for the kids to actually do, and the documents that suggest a progression of inquiry did not require much modification. There are four parts, and for each part I made sure they knew what they were expected to do and look for and write down, gave them time to work, then regrouped and had them share their conclusions and reasoning. ...which if this interests you enough to check it out, I'm sure you can figure out why. DGS is awesome but poses unique challenges. Kids can look at a million different examples of something (yay! ), but then they think that constitutes a proof. Sometimes they don't bother looking at the million different examples - they just look at the screen as it first appears, and guess. Kids can measure anything (yay! 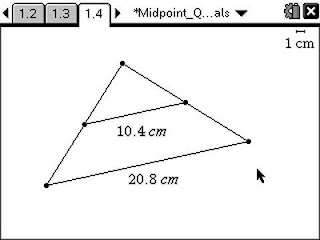 ), but they can use that to circumvent your goal of teaching them to use their understanding of a property to solve a new problem. You can set out an activity with lots for them to do, and kids like pushing buttons and it keeps them busy, but some of it is just busy work. The translating of the button pushing to the learning is where the work lies for a teacher. ...and that's it. Hm. Thanks, TI. 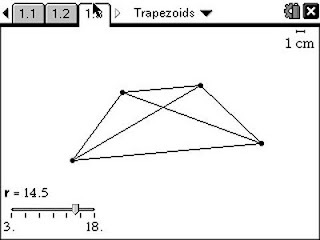 Which is made out of trapezoids and looks kind of fun, but is not going to help us with "Investigate, justify, and apply theorems about trapezoids (including isosceles trapezoids) involving their angles, sides, medians, and diagonals." 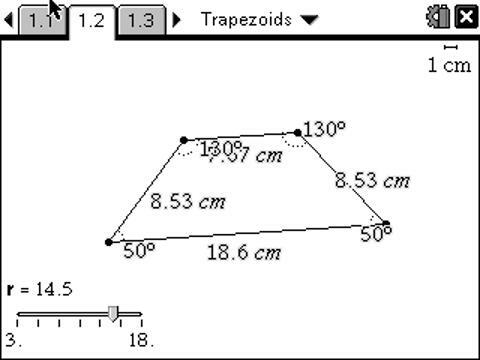 How about Geogebra Wiki? Maybe there's something I can adapt there. 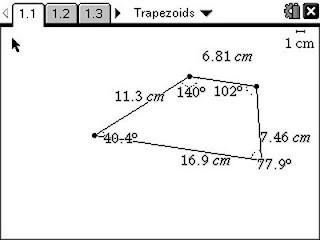 But a search on the High School Geometry page for "trapezoid" returns nothing, as does the same search on the Quadrilaterals page. So, yeah. I guess I'm stuck making a new thing. Awesome. 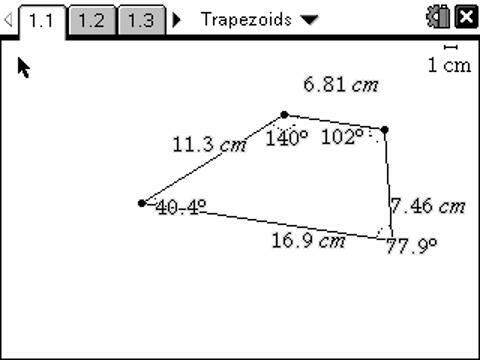 My file ends up being three pages, with questions to explore about each, with the goal of discovering the properties of trapezoids and isosceles trapezoids. And then some "use the properties to find the missing thing" problems. I am not super into demonstrating examples and then making them do the same exact thing. Then they're exercises, not problems. So, this lesson gets the job done, but it's not terribly satisfying. 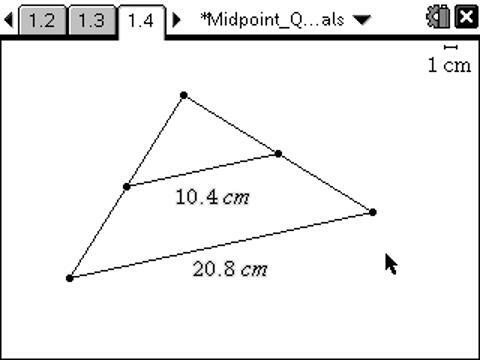 The kids completed the tasks gamely enough, and they'll remember the properties better for having seen a bunch of examples using the DGS. But it was pretty boring. (Although not as boring as listening to me wah wah wah my way through telling them the properties and doing example problems for them to copy down.) You got a better idea? Let me hear it. And I swear if anybody says do the same thing except put a picture of a bridge in the background, I'm going to throw up. 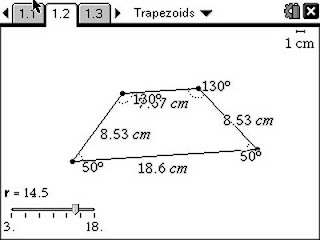 Here are the files for the trapezoid investigation, and also a similar lesson for kites. 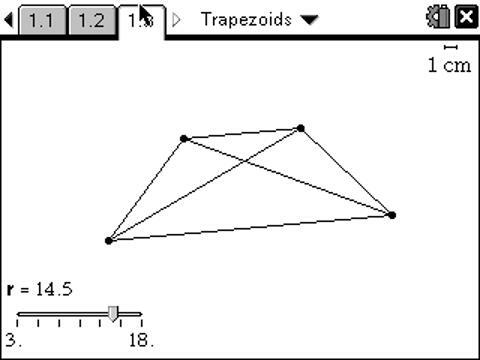 1With reciprocal trig functions and logs to any base, features which will be disabled in Test Mode for state exams. Deity help us.